Coney Island is still the People’s Playground. You can come here with a couple of bucks in your pocket and have a great time people watching on the boardwalk. Here’s our guide to more than a dozen free events this summer, including fireworks, music, dancing and movies on the beach. Stay tuned for the 2012 schedule of the Seaside Summer Concert Series, which will once again be held at Surf Avenue and 21st Street in Coney Island beginning in mid-July. Update July 7: The free concerts begin on July 12 with Gloria Gaynor and the Village People. Among the six summer concerts are Joan Jett and the Blackhearts on August 9 and Gladys Knight and the Commodores on August 16. Check the Seaside Concert website for full schedule and details. Friday Night Fireworks, June 15 through August 31. Coney Island Boardwalk. 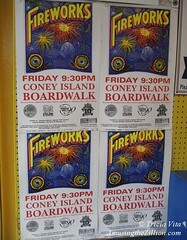 The first Friday night fireworks of Coney’s 2012 season begin today at 9:30 pm. The free summer-long show is once again sponsored by Deno’s Wonder Wheel Park, Luna Park including the Scream Zone and the Cyclone, and the Brooklyn Cyclones. In addition, the Cyclones have scheduled fireworks on their Opening Day– Monday, June 18th—as well as on Wednesday, July 4th, and four Saturdays when they have home games: July 7, August 4, August 11 and August 25. Friday night “Karaoke on the Boardwalk” in front of the Wonder Wheel also starts today from 7pm. Coney Island Dancers Outdoor Dance Parties, Boardwalk at W 10th Street and W 15th Street. Dance and party at two locations on the Boardwalk this summer with the Coney Island Dancers. CID’s Commander-in-chief Rican Vargas–he’s the guy in military whites– says the group has been performing on the boardwalk for almost 15 years: “Just follow your ears to the beat and your eyes to the gathering.” The weekend parties are 12 noon till 8pm, with a street festival set for Saturday, August 18th on West 10th Street. Check the schedule on CID’s website. 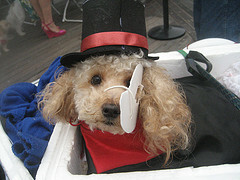 Pet Day and Pet Costume Contest, Deno’s Wonder Wheel Park. Saturday, June 16. Last Year’s 1st Annual Pet Day was an occasion for costumed dogs and one lucky parrot to parade on the Boardwalk and ride in miniature floats. The pooches wore a sailor hat, an opera hat, sunglasses and even a Hawaiian skirt. We’re hoping to see a Noah’s Ark of exotic pets this year–how about a hermit crab or an iguana? The costume contest begins at 2pm, with preregistration recommended for the 25 slots. Pets are also invited to ride the Wonder Wheel with their owners. Sonny, a Rottweiler owned by Wonder Wheel Park’s Vourderis family, used to ride all day in his very own car. He loved the Wonder Wheel. RIP Sonny. 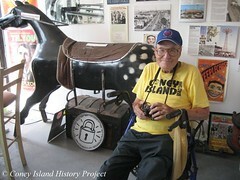 Abe Feinstein at the Coney Island History Project. Photo © Coney Island History Project. “Abe Feinstein: 50 Years of Coney Island Photography,” Coney Island History Project, through July 1. In the History Project’s free exhibit center on 12th Street, you’ll see photos of a vanished Coney Island that you won’t find anywhere else. Abe Feinstein, 83, has been photographing his neighborhood since he moved to Luna Park Houses in 1962. Selected and printed by History Project director Charles Denson, the images include icons like Steeplechase Park’s Pavilion of Fun, the Parachute Jump in action, and Shatzkin’s Knishes, where signs advertised huckleberry and cherry knishes. The show runs through July 1 at the exhibit center, which is open Saturdays and Sundays from 12 noon till 6pm. Mermaid Parade, June 23. We’ve met New Yorkers who passionately proclaim their love for Coney Island though they come here only once a year for the Mermaid Parade. It’s worth the trip from anywhere. If you plan to join the parade as a mermaid or other sea creature, we recommend registering in advance. Our fave free spot to watch (and photograph) the parade is near the reviewing stand on Surf Avenue at West 12th Street, where marching groups strut their stuff and bribe the judges. Other good spots to watch the parade for free are on Surf Avenue at the corner of Stillwell facing Nathan’s or West 10th near the Cyclone. The Boardwalk has great ambiance, but you’ll miss seeing the hippie buses and vintage cars. This year the parade is celebrating its 30th anniversary and is bound to be jam-packed. It starts at 2pm. Don’t be late–or you may find yourself unable to swim across Surf Avenue! Flicks on the Beach, Schedule TBA. Last summer, Flicks on the Beach was a welcome new addition to Coney’s roster of free summer-long events and will be returning this season though the schedule has yet to be announced. The Coney Island Development Corporation (CIDC), NYC & Company and EpixHD partnered with Rooftop Films to launch the free Monday night film series on the beach. The event drew over 3,000 attendees to its eight movie screenings featuring such popular films as Saturday Night Fever, Annie Hall and Moonstruck along with pre-show entertainment and contests. Which flicks would you like to see this summer? UPDATE July 9: The 2012 season of Flicks on the Beach began on July 2 and continues on Monday nights through August 6 August 13. The schedule includes Bound for Glory featuring David Carradine as Woody Guthrie, Woody Allen’s Manhattan, and Jim Henson’s The Muppets. Full schedule here. The show begins at dusk on the beach near West 10th Street. 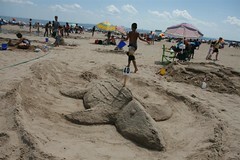 22nd Annual Sand Sculpting Contest & Unity Day, July 21. According to the contest sponsor Astella Development, amateur sculptors will compete in five categories for cash prizes of $400, $200 and $100. The contest takes place on the beach from West 10th to West 12th Streets, where fifty mounds of sand are prepared by the Parks Department for the sand sculptors to transform into works of art. Pre-register online at Astella’s website. 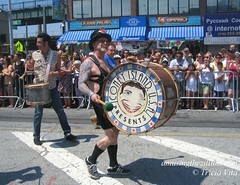 3rd Annual Coney Island Talent Show, July 28. The first Coney Island Talent Show – “A spectacle of sunshine and lollipops on the Boardwalk!”–was the most successful new Coney event of the season. It featured singers, dancers, magicians and jugglers, as well as a contortionist, a sword swallower, and Justin Bieber and Jackie Gleason impersonators. The 3rd annual talent show might feature — you! Producer Jen Gapay of Thirsty Girl Productions has posted an open call for contestants for this year’s contest. The talent show’s four categories are Creative Kids 9-12 years old, Creative Kids 13-17 years old, Circus Freaks and Sideshow Geeks, Song and Dance, and Best Drag Performance or Celebrity Impersonator. For an application visit coneyislandtalentshow.com. 7th Annual Deno’s Wonder Wheel Music Marathon, August 4 and 18. A dozen rock and surf bands including The Clams, Strange But Surf, and Beware the Dangers of a Ghost Scorpion! will play on the Boardwalk in front of the Wonder Wheel for two Saturdays in August from 2pm. Brooklyn babes Witches in Bikinis are perennial faves. According to their bio, the group formed in 2005 for a performance of ‘Witches In Bikinis’ with one singer and two witch back-ups at The Slipper Room in Manhattan’s Lower East Side for a fundraiser. Current witches Ali, Dreamie, Kaitlin, Kendra and Ruthie will cast their spell on August 18. 2nd Annual History Day at Deno’s Wonder Wheel Park and The Coney Island History Project, August 11 August 12. For the second year in a row, the 92-year-old landmark Wonder Wheel teams up with the non-profit Coney Island History Project to bring live music, entertainment and history to the heart of Coney Island. 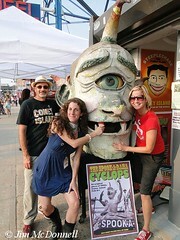 Last year, Spook-A-Rama’s legendary Cyclops came out of retirement to join in the fun. At this season’s event, the Hungry March Band, Banjo Rascals, Benjamin Ickies & the Coney Island Screamers, and Lady Circus will perform on the Boardwalk, West 12th Street and throughout Wonder Wheel Park. A Coney trivia contest with historian Charles Denson and a Wonder Wheel Draw-a-thon are some of this year’s activities. Prizes include ride passes and souvenirs of good ol’ Coney Island. 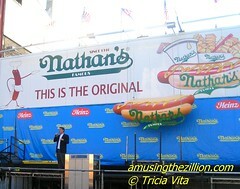 Many thanks to Coney Island photographers Bruce Handy and Jim McDonnell for their photos.